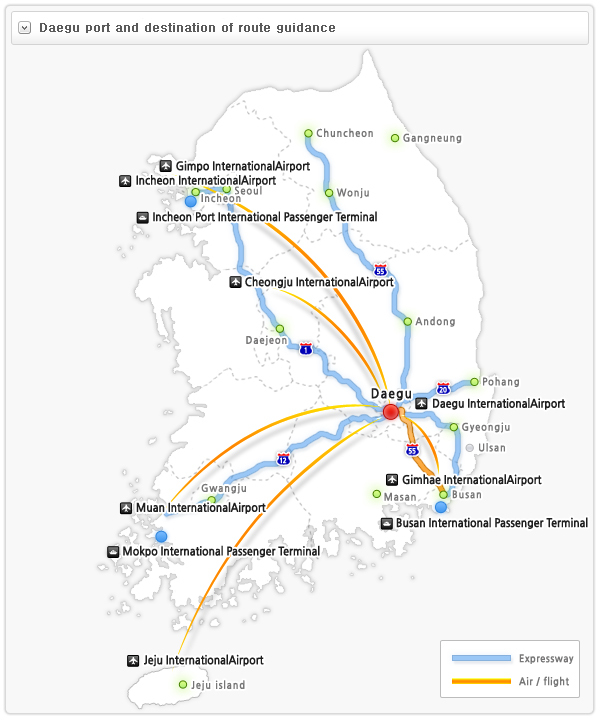 A guide map of airports and transportation out of Daegu. Suseong Resort is a reservoir resort area in Daegu’s southeast side. Ringed by trees and a walkway with benches, many young couples come here to take a walk or enjoy the beauty of the reservoir. You can often see middle and high school students who come here to practice sketching landscapes. People can enjoy boating or windsurfing in the reservoir. On the west side, Suseong Land has a few rides and attracts crowds until late at night. -Directions: Take #404, 435 bus at the Dongdaegu Express Bus Terminal next to Dongdaegu Station and exit at Suseongmot 5 (O) geori, 5 minutes walking. http://english.daegu.go.kr/cms/cms.asp?Menu=738 a website that covers all of the REALLY important stuff that foreigners might need on hand. Telephone to the immigration office, where to find an English speaking doctor, etc.